In the Southern hemisphere’s gyres we have sufficient data to confirm the presence of floating plastic debris (Eriksen et al. 2013, 2014, Cózar et al. 2014, Miranda-Urbina et al. 2015). However, more data is needed to eliminate the possibility of introducing potentially large errors in global estimates of the amount of floating plastic (van Sebille et al. 2015). During this expedition, Algalita collected plastic pollution samples across the Equatorial Currents, the South Pacific Subtropical Gyre and at various stations along the Chilean coast in order to strengthen the existing data set. In addition to quantitative analysis, Algalita investigated how plastic in the South Pacific threatens fish survival in this region. Lanternfish (myctophids) account for as much as 55% of global fish biomass and they play a critical role in the food chain. The health of the entire ocean is dependent on their survival and any disruptions can have a domino effect that may lead to ecological collapse. An Algalita study, (Boerger et al. 2010), found that 35% of these fish in the North Pacific Subtropical Gyre had consumed plastic, some in large quantities. July, 2017. 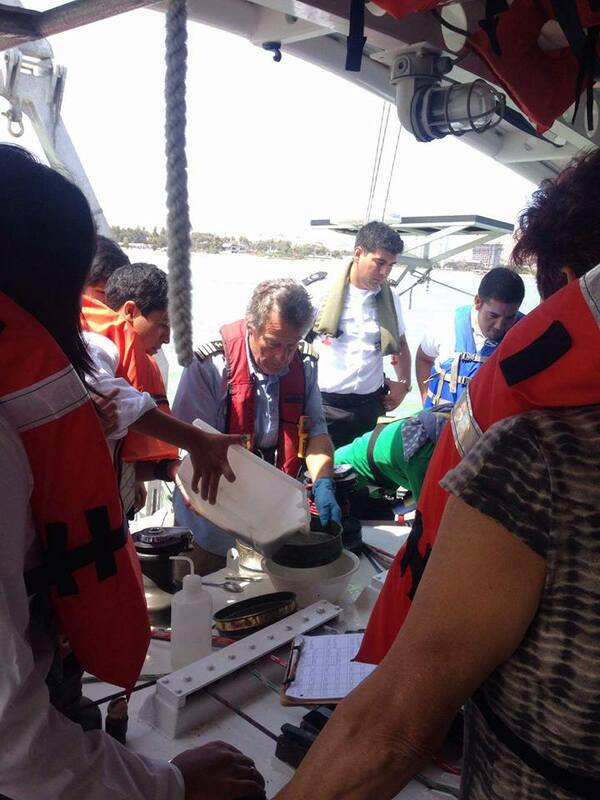 Algalita continues its work in Coquimbo, Chile. Gwen Lattin, Chief Scientist and Research Biologist, teaches students in the Cientificos de la Basura Program how to analyze Trawl samples. April 10. Framing the Garbage Patches - N 14 13.102, W 106 01.134 – Raquelle de Vine. It was nearing the end of a not-so-eventful day and we had lowered the sails after the wind dropped off. I was sitting up on the deck keeping watch and Gonzalo was at the helm. Off our starboard side, I spotted a piece of green Poly pipe floating past the boat, slightly below the surface. Only a foot long, it was gone out of sight by the time we had slowed the boat down and I headed to the stern to find it. Captain Moore, never one to lose hope, encouraged the pursuit of it and so we began to back up looking for it. Our search left us without the green fragment, though not empty handed, as at the slower speed we were alerted to a heavy concentration of meso and micro fragments around us! Thinking we’d found a windrow (an area of converging waters), Charlie and I were excited to put the Manta Trawl in and take a sample. I couldn’t believe what we were seeing! Here at the southernmost reaches of the North Pacific, having only just crossed the equator and far from land or any known accumulation zone, we are finding similar concentrations to that of the outer limits of the South Pacific Subtropical Gyre. I was sure I had left sights of those sickening concentrations well behind. I was struggling to make sense of it, however, Captain Moore had an idea. As we drifted along, capturing highly weathered and fouled fragments (instead of the macrodebris that have been our typical catch so far for Leg 9), it seemed we were tracking through not just a highway feeding into the North Pacific “Garbage Patch” but at 6° degrees North we had discovered a possible South Eastern border of the accumulation zone. Gathering data to frame both the “garbage patches”, Algalita and Captain Moore are one step closer to understanding these ever-changing systems. We know that the high-pressure systems that sit consistently in the eastern reaches of both the North and South Pacific determine the wind circulation and the currents that border the accumulation areas. These border currents, however, do not seem to move debris in consistent bands, but in smaller patches defined by eddies, windrows and small scale current systems. Over the last few days we have continued making our way North toward Cabo San Lucas. We’re making the most of the winds where we can, trawling and hand netting, retrieving debris as we find it and contemplating the latest information. As the saying goes, the more you know, the more you know you don’t know…. Exciting prospects ahead! We’ve also had a few “visitors” to keep us entertained: a pod of over 100 Spotted Dolphins playing in the bow wake and a tuna-spotting helicopter flying by when we were well over 600 nautical miles from any land fall! We also saw a Marlin while swimming this morning and a Galapagos Shark cruising around while we retrieved a 20L container! April 10. As reported earlier, crossing over into the North Pacific Gyre brought the discovery of the "Gyre Rings" . Today I bring you a sample of microplastic and blue copepods from the Southeast corner of the N Pac Gyre, 625 miles south of Cabo San Lucas. The discovery of the corners of the Gyre followed the successful completion of our South Pacific Expedition. April 9,. We’ve found the Corners of the Gyre! - We’ve passed through two drifts of garbage that are part of the circulatory system of the Gyre, bringing garbage to the North Pacific. We are now in the North Pacific. We passed about 6 degrees north latitude and found our first highway of garbage heading toward the North Pacific Garbage Patch. Then at about 9 degrees north latitude, we found our second concentration of garbage. In between, it’s very clean. So it’s like the rings of Saturn…like there are different rings of the Gyre that are bringing this debris in. We would find an area of trash, and then no trash. Then more trash, about 400 miles apart. So it’s not a seamless concentration of debris…it’s patchy concentrations. This is the Southeast corner of the North Pacific Gyre. So the latest findings we have is the discovery of trash at the Southeast corner of the North Pacific Gyre. April 8. Phase 1 - Gyre Comparison Data Collected and Phase 2 - Myctophid Study. 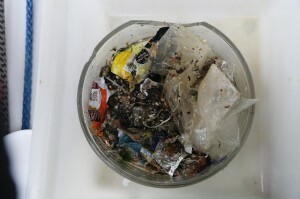 We’ve successfully sampled and confirmed the existence of a “South Pacific Garbage Patch”. We've discovered life itself in the South Pacific Gyre is less than in the North Pacific. The South Pacific Gyre was more of a desert than the North Pacific, which was a surprise to me. We didn’t get any Myctophids from the South Pacific Garbage Patch. The reason being is the conveyor belt that brings nutrients from the circumpolar current around Antarctica that feeds much of the ocean, goes deep under the South Pacific Gyre so it has less life in it than the North Pacific. In the North Pacific Gyre life is fed from the nutrients dredged up by the circumpolar current at the South Pole which surface in the North Pacific Gyre. Therefore, we didn’t see a lot of Myctophids coming to the surface for plankton because there is much less plankton there than in the North Pacific Gyre. So without Lantern Fish (Myctophids) from the South Pacific Garbage Patch, we can’t compare the South Pacific ingestion levels of eating plastic with the North Pacific. Another surprise was how little life there was in that part of the ocean. Therefore, the plastic to plankton ratios will be quite high. After leaving the Gyre and at 500 miles to the seaward of the Galapagos, we began to see more and larger Myctophids and are now collecting them for further lab analysis. We have done hand netting as well as Manta trawling in an area we had not planned on. Our course change has taken us to uncharted deep water territories we would not have explored had we been able to execute Phases 3 and 4. However, speaking in terms of the world's Garbage Patches”, my subjective opinion is that what we’ve discovered in the South Pacific Central Gyre in 2017, compares to our 2007 North Pacific Gyre Expedition data findings. Algalita will be the only environmental group focusing on Myctophids . We will have a lot of Myctophids for study and have frozen samples for lab analysis. I can’t stress the emphasis enough on this research since 1 out of every 5 oceanic fish is a Myctophid, comprising about half the weight of the fish in the ocean. They are difficult to collect because they live far offshore. That’s why Algalita, with its special vessel and long range voyages, is focusing on this fish. Myctophids symbolize the vastness of the ocean and this small fish, none of which are as big as a sardine, actually is the most important fish in the ocean and yet is has been studied very little. This is why Algalita, being a pioneer in the little studied effects of plastic pollution, is also a pioneer in the understudied species that represents the vast amount of the ocean’s biomass and will make Algalita a specialist in Myctophids and plastic pollution. So, in spite of the setback of losing our Port Engine early In March, Phases 1 and 2 of our mission have been successfully accomplished. Phases 3 and 4.Collaborating with our Chilean and Ecuadorian Friends. Along the way we have “made friends and influenced people,” giving many talks on our work to end plastic pollution. In addition to sampling the South Pacific Gyre, using the Manta Trawl, we took over 50 surface water samples along the coast of Chile, comparing them with beach data, which will be analyzed for plastic content at the Universidad Catolica del Norte in Coquimbo, and will provide the first ever baseline data set for the northern half of the country. These two sample sets at UCN comprise two of the three projects that we had planned for our voyage to Chile. The first being a return to Easter Island and the second being the return to the Galapagos Islands. Easter Island and the Galalpagos. This part of our Expedition was two-fold and was to be dedicated to assisting our neighbors in Chile and Ecuador in gathering data important to their respective and our collective work projects. First, we were scheduled to return to Easter Island to provide research vessel support to (ESMOI) Ecological Sustainable Management of Offshore Islands. This trip comprised two goals. One was to employ a submersible equipped with deep water robotics to take photos. The other was to obtain samples using a deep water trawl to search for, and verify previously unknown species off Easter Island. Without a voucher sample, verification is not possible. This was to be accomplished by capturing fish at depths of a hundred meters or more. ita’s Expedition goals have been achieved and we must get home before the hurricane season is upon us. The good news is, we have accomplished much in addition to our own mission. We have worked with the wonderful people of Chile, Ecuador and Easter Island and the Galapagos, all with the same purpose……bringing the plastic pollution era to a close. 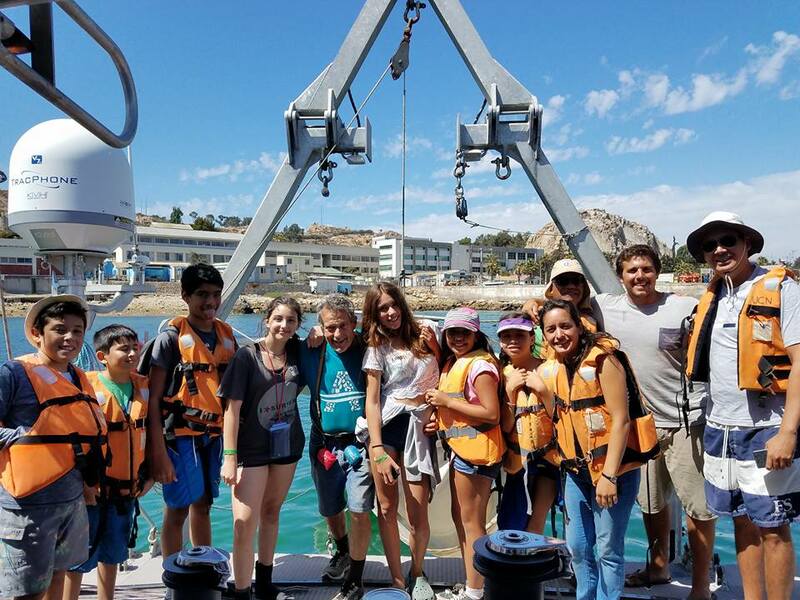 We have conducted vessel tours and near shore trips for school children, scientists, members of the Chilean Navy and government officials. Our colleague, Juan Pablo Munoz of the Universidad de San Francisco de Quito, Ecuador, collected some samples during an earlier project. Our vessel Alguita, would have provided him an opportunity to gather prime data farther off shore. Both phases were our way of accommodating our friends to do work they could not otherwise do. Unfortunately, we experienced Port Engine failure in mid-March. Without the capability to deploy the heavy duty cable integral to this phase of the work, it became impossible to move forward with these two phases and we regrettably cancelled them. Therefore, we had no alternative but to change course for home port. This Expedition, prior research in the North Pacific, the 2012 Pacific Rim Plastic Pollution Conversation Tour and our solid baseline work in Chile over the past three years, has continued to expand world awareness of our struggle to bring the plastic pollution era to an end. This has been my life's passion and work over the past twenty five years and I see it beginning to pay off, most recently in this wonderful country. However, each day is a challenge and the financial burden increases as the hours go by. We need your help now, more than ever. It is my hope you will support our great endeavor with "the vessel that made history in the North Pacific Subtropical Gyre" and allow us to begin analysis of our newly captured data to share with the world. Please identify your donation with "Bring the Alguita Home". www.algalita.org"
March 30. Stay tuned as the ORV Alguita and crew make their way home on one engine. As Captain Moore says, beautiful sunrise in the Doldrums, but with no wind, let's hope the fuel lasts.......more to come. March 19. Sunken sails - S 13 14.542, W 89 05.632 – Never a dull day on ORV ALGUITA! Firstly, those 15 knot Trades I’d mentioned proved too much for the original welded-fabrication padeye located at the masthead, from which the gorgeous Rasta-hued spinnaker billowing out before the bows was pulling our 25 tons through the water at 8 and more nautical miles per hour. The padeye broke, the crew recovered the sail from under the boat and Paulo again went aloft. Our spare parts locker, however, failed to yield an exact replacement padeye, but Paulo and Gonzalo created a slick jury rig that adapted a nice cast one to the task – stronger too! Their innovative solutions also came in handy fixing a crack in the starboard hull that Facundo found after a long investigation. Meanwhile, the winds from astern kept increasing through the night to around 20 knots, and around the time of the 4am watch change, the spinnaker “blew out” (i.e., split along a sewn seam). Fortunately, we have an older one in reserve for when we know we are going to want to use it upon reaching the vicinity of the Equator. The Captain selected a Wing & Wing sail configuration, with the Genoa jib deployed to one side and the mainsail to the other. That worked dandy for a number of hours, but then those following winds became a bit fickle and backwinded the main, thereby causing it to jibe with such force that the block on the Preventer split wide-open and the synthetic line itself parted with a loud “POP”. Scrambling once again, the sail was dropped, and then began the job of threading in a new rope through the inside of the boom and system of pulleys back to the line handling station in the cockpit. Now we’re back to running with just the Genny (and experimenting with other sail and engine combinations for best performance). In other words, the crew is rapidly gaining experience and we get by with what we have on hand! But nothing has proved unsolvable yet and we are still making headway home with plenty of smiles! March 19. Fair winds and following seas S 15 34.77′ W 82 57.171′ - John Koster. Ahoy, I’ve rejoined Oceanographic Research Vessel ALGUITA for her homeward-bound leg from Arica, Chile (the City of Eternal Summer) to the boatyard in San Diego, California. Capt. Charles Moore and his crews documented immense amounts of pelagic plastic in the South Pacific Gyre, as well as finding microplastics everywhere along the route of this expedition that will soon total more than 10,000 nautical miles. Unconstrained production of plastics is now up to 300 billion kilograms per year. An emerging issue of concern is the human health impacts of plastics, especially those in packaging and consumer goods. Charlie has coauthored a chapter that appears in the very recently published book Integrative Environmental Medicine by Cohen & vom Saal (2017), ISBN 978-0-19-049091-1 https://global.oup.com/academic/product/integrative-environmental-medicine-9780190490911?cc=us&lang=en&. This chapter represents the first medical review of plastics-caused human health syndromes for the use of healthcare professionals. Fair winds and following seas. It is a sailor’s fondest expression of ideal sailing conditions. We’ve been rocking along all day with a classic rolling gait. We sit so low to the water that from our perspective, the 360 degrees of horizon is not a smooth line – is instead punctuated with peaking swells far out from us. We had cause for some extra excitement yesterday when the spinnaker halyard was determined to have jammed in the sheave at the top of our mast. Two intrepid members of our 6 person multinational crew, Raquelle and Paulo made several trips up in the bosun’s chair, each spending several hours 70 feet above the deck in the ultimately successful attempt to free it (if you can imagine such a thing in a seaway!). If it were my call, I’d say that they’ve qualified themselves for bivouacking on the face of Yosemite’s El Capitan. March 18. - S 16° 19.085 W 80° 34.347 California Bound – Raquelle de Vine. We’ve been sailing towards our next destination, California for 5 days now. There has been a change in direction; learn why here. It’s been hard to keep track of where the days start and end, but here we are, a great crew of new and old, a slightly beaten, but not defeated, Alguita and a great sense of accomplishment, back out on the big blue heading home. We are so grateful to have Facundo Resendiz from Leg 1 and John Koster from Leg 3, join us again. Our gratitude also extends to our 2 new crew members, Paulo Goncalvez Martinez and Gonzalo Muñoz Garcia Huidobro, both from Chile. Read their biographies here. Our first days passed quickly as we headed west off shore, pursuing the South Eastlery trade winds. It has been a flurry of running ropes, flapping sails, soaring birds, and blowing winds! Today, however, our Spinnaker has been billowing comfortably off our starboard bow for the last 24 hours, filled with the south easterly trades we were chasing! Ahhhh bliss. The calm mornings have allowed us to drop our Manta trawl into the sea again. We can conduct full 30 min trawls again now that we are back off shore and no longer in the highly active, nutrient-rich waters of the Humboldt Current that promptly fill our cod net with organisms. 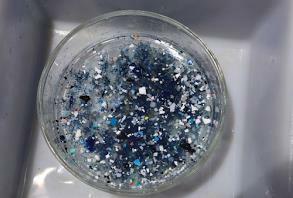 It is interesting to observe the changes in the micro-plastics as we travel further and further off shore. On our way from the South Pacific accumulation zone toward Chile, we noticed the volume of plastic film and identifiable consumer goods began to increase as we got closer to shore. Now we are noticing a decrease in these items, and in their place, more microplastic fragments. It is interesting to consider these trends and comparing nearshore and off shore samples. In the near shore waters we find foil wrappers, large and broken containers and other intact items, whereas off shore we find mostly small, hard fragments. It makes me wonder where all the other types of debris items have gone? Have they sunk to the bottom of the ocean, been eaten, or deposited onto some unsuspecting area of coastline? Our collaborators at the Universidad de Catholica del Norte are going to investigate this, comparing offshore and nearshore trawl samples and identifying concentration areas. Another observation about our trawl samples is that the composition of the fragments in our offshore samples is generally very consistent. Why? There are many different types of plastic depending on their chemical composition and manufacturing process, however there are 6 main materials that are most commonly used. They can be identified by the number in the center of the chasing arrow symbol you see printed on the bottom of most plastic products. The numbers correspond as follow; 1: Polyethylene Terephthalate, PET, often used for single use water bottles and food packaging. 2: is High Density Polyethylene, HDPE, used for slightly more durable containers and plastic bags. 3: Polyvinyl Chloride, PVC, commonly known for piping and plumbing but also used for storage containers and household hardware. 4: Low Density Polyethylene, LDPE, most commonly light weight plastic wrap and shopping bags. 5: Polypropylene, PP, the most commonly used in food packaging and 6: Polystyrene, PS, that we know all too well as single use plastic items like cutlery, and (expanded polystyrene) food trays. The density of each material determines whether it will sink or float. There are exceptions however. For example, a piece of floating debris may be a surface for an organism to attach to which may cause it to sink. Those items made from buoyant (floating) plastics are most commonly found in the nueston (surface) layer. You can do an experiment at home (or school) to test the density and buoyancy of different kinds of plastics. Take a selection of the different plastic materials in your recycling bin and put them in a bucket of water to observe whether they sink or float! March 14. Algalita’s Expedition to the South Pacific Gyre Changes Course. Posted by Katie Allen, Algalita Marine Research and Education's Executive Director. “..No matter what happens from now on, as we leave the northernmost city in Chile, Arica for home, I can state with confidence that our mission to compare the South Pacific Gyre to the North Pacific Gyre, and sample its plastic load has been a resounding success. Along the way we have “made friends and influenced people,” giving many talks on our work to end plastic pollution. In addition to sampling the South Pacific Gyre, we took over 50 surface water samples along the coast of Chile. 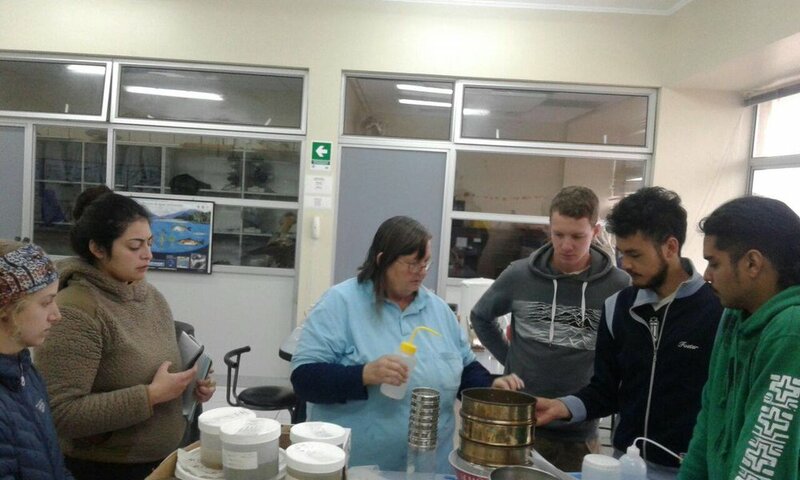 These will be analyzed for plastic content at the Universidad Catolica del Norte in Coquimbo, and will provide the first ever baseline data set for the northern half of the country. These two sample sets at UCN comprise two of the three phases that we had planned for our voyage to Chile. The third was to have been a return to Easter Island so that we could deploy a submersible for ESMOI (Ecology and Sustainable Management of Oceanic Islands), which would not have been an Algalita plastic sampling mission. The reason for our failure to complete the third phase of our planned research in Chile is the following: on the way from Coquimbo to Antofagasta in Lat: 25 14.525 S Long: 70 34.835 W, at 4pm during Buck Osegueda’s watch, upon inspecting the port engine, he reported seeing smoke and hearing a loud noise from the motor, and immediately shut the engine down. I went into the engine room to evaluate the situation. When we again started it, the engine sounded like it had thrown a piston rod. This type of failure is not unheard of in a diesel engine like ours with over 5,000 hours of heavy use. March 11. La Estrella News Article. 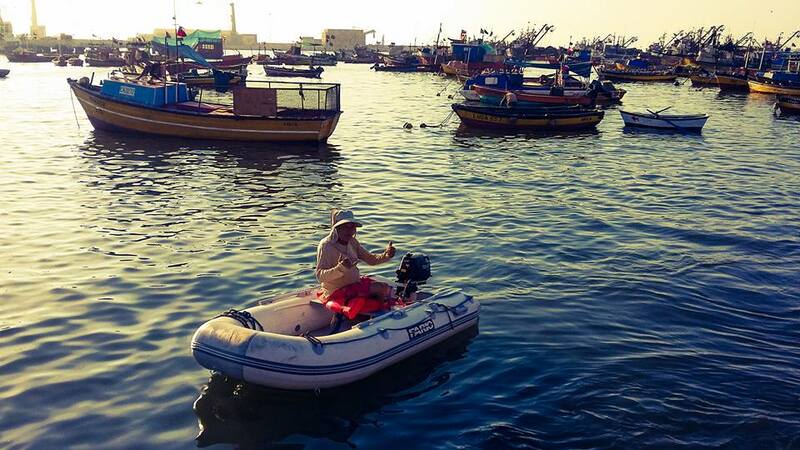 "The Super Captain and his Ecological Catamaran". 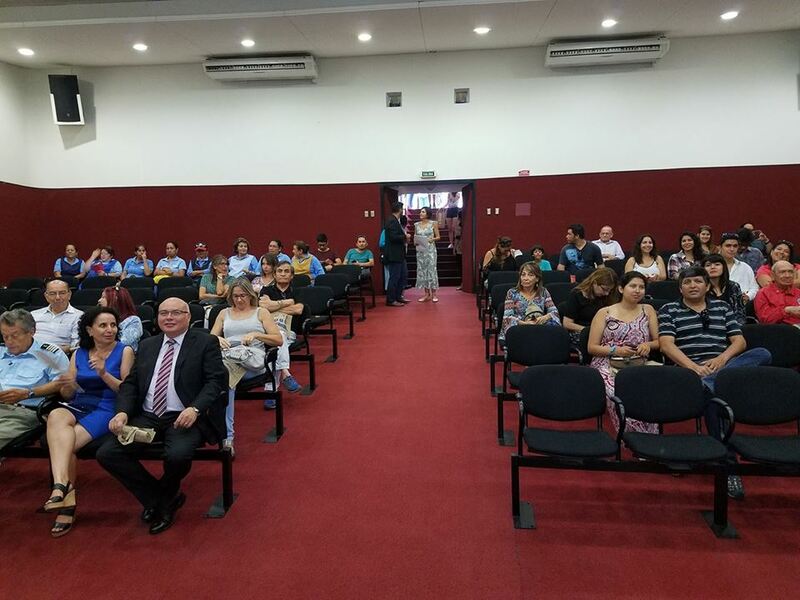 Last night I met with a super group of local community members and students at the University of Tarapacá in Arica, Chile, for my talk on our preliminary findings sampling surface plastics in the South Pacific Gyre. Lots of discussion afterwards on next steps in organizing to fight the plastic plague. Here is a wonderful Spanish article in La Estrella --- one of Chile’s finest news purveyors. Below is the English translation. "..Charles Moore, an American researcher, a surfer and once boat racer, , travels along the Pacific coast aboard the vessel Alguita, collecting garbage and creating environmental awareness. It was 1997 when Charles Moore discovered "the plastic garbage patch" in the North Pacific Ocean, which far from having the expected landscape of islands, it housed all the plastic trash that nobody recycled, and that everyone in the world threw away. Since then, the researcher has become aware of the use of plastic in his philosophy of life. His interest arises since he is aware of the respect and affection he professes to the sea. He travels for miles on his Alguita catamaran, whose name derives from his love of algae. Charles Moore says that "plastic is present in all the elements that we know, it has so many uses after its useful life, but it is easier to throw them into the sea, and in a hundred years more we will have almost half of the oceans with plastics ". "I entered this maelstrom of plastic awareness and its lethal effect throughout the environment because the damage is gigantic. I talk to authorities, environmental organizations, local people, but as we are organized to reverse this trend of more plastic pollution , “What can be done is almost nothing, "says the Captain Ecologist. However he says he is optimistic, since in each place that he finds, he is adept to his cause and to the prevention of throwing plastics and other waste to the sea. 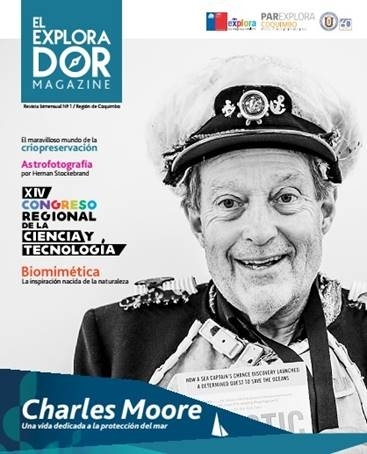 "The activist is not the one who says the river is dirty, the activist is the one who cleans the river," says US politician Henry Ross Perot, modifying the phrase a bit, so Charles Moore is not only an activist cleaning the ocean, he is a daring activist. And how is he defined today ?. "I used my name and my notoriety to change minds, to raise awareness. I went from being a scientist to an activist, this I will do until the last day of my life. I talk to everyone who wants to hear me and catch the wave, this is real...it affects us all, and we are all responsible, but we are all actors of change, and that is a hope. " March 10. 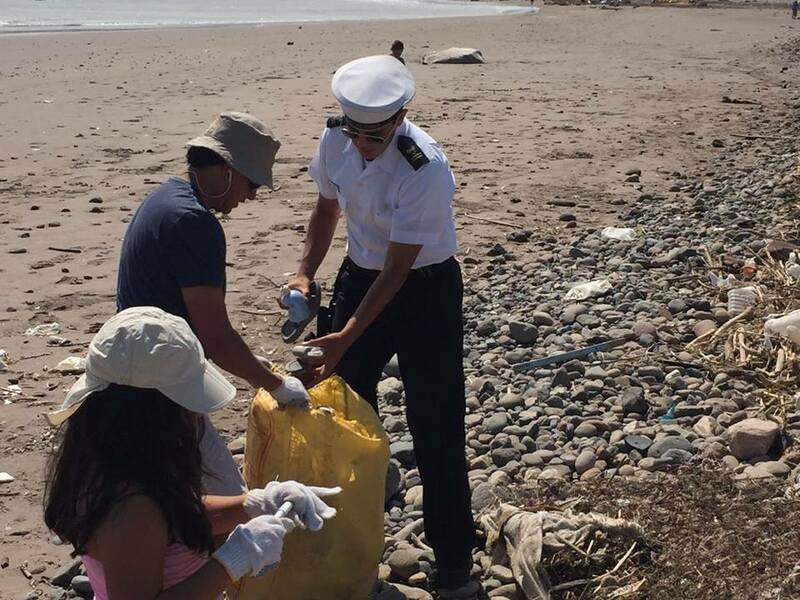 Expedition Update, Over the past few weeks Captain Moore and his crew have been documenting plastic pollution along the Chilean coast while traveling north from Antofagasta. 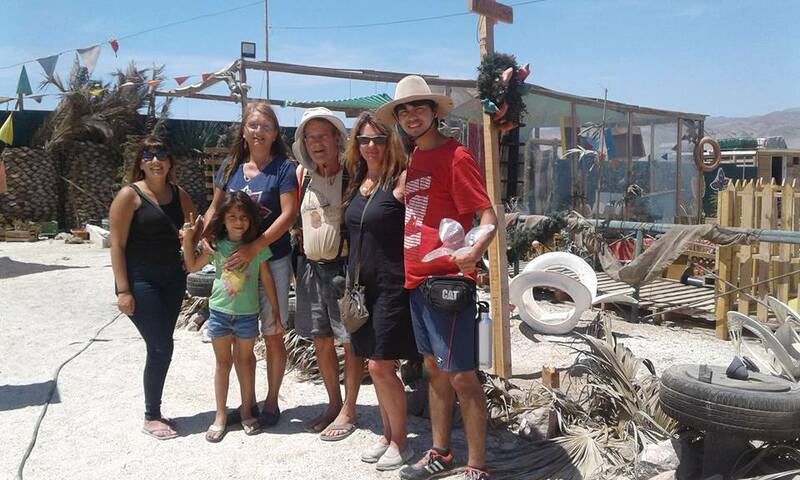 After arriving in Arica, the crew worked with Tortu Arica Ong Tortugas Marinas to raise awareness about the issues facing green sea turtles at the mouth of the Rio San Jose. Captain Moore gave numerous presentations during this time and hosted many students on the Alguita for tours and offshore mini-sampling trips. 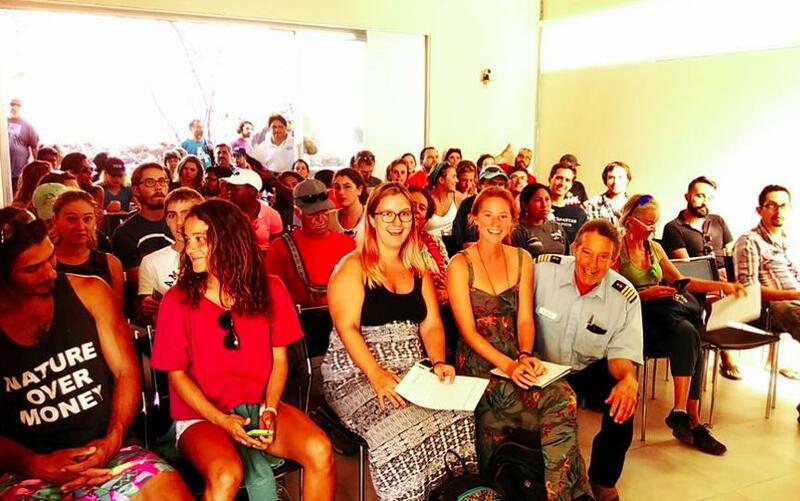 Working to strengthen the fight against plastic pollution in this region, Captain Moore has given numerous presentations and invited community members of all ages to sail aboard the ORV Alguita via Algalita's Ship2Shore Field Research Program. This adds to his growing numbers of students joining "The Plastic Pollution Conversation"'. The crew is planning to leave Arica in the next few days. Instead of traveling back through the South Pacific Gyre, the Alguita will be returning to California to undergo engine repairs and maintenance. Stay tuned for an update from the Captain himself. March 9. Ship2Shore in Arica – . – Raquelle deVine. On the 4th of March, we said goodbye to our trusty mate Buck! 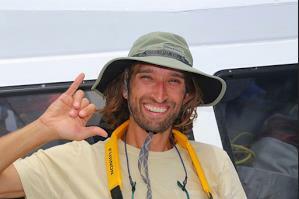 He’s off on a fantastic adventure back to the Galapagos Islands to volunteer with Juan Pablo, (remember him from Leg 4?) on his turtle conservation program. We will miss having Buck’s big personality, beaming face and constant jokes aboard the Alguita. He has been an invaluable member of our crew for the last four months and his absence will be surely noticed, but we are super excited for him and wish him all the best! The following day we had a busy day planned with a local school group coming aboard for our Ship 2 Shore program! We were grateful for the arrival of Facundo, our trusty right hand man from back in Long Beach, and Sabine Rech, who is studying the rafting organisms found on the plastic debris we have collected. It was a great day with 28 people aboard the ORV Alguita sampling Arica’s surrounding waters. The students got to sorting the organisms from the microplastics in 3 of the trawls. It was a real eye opener for them when Captain Moore asked them about plastic pollution; they had never heard of it. Wow! This is what it is all about, opening the eyes and ears of the communities we travel to, to understand the state of the earth in which they are living. I think of the words of Nelson Mandela when he said that “education is the most powerful weapon which you can use to change the world.” It is this through research and outreach that we will win war on plastic pollution! We were also lucky to have a small crew of representatives from Tortu Arica ONG, the local Turtle Conservation group on board. They have been dealing with the impacts of plastic pollution on the fragile populations of Green Sea Turtles and Leatherbacks that stop here in Arica on their migratory routes. 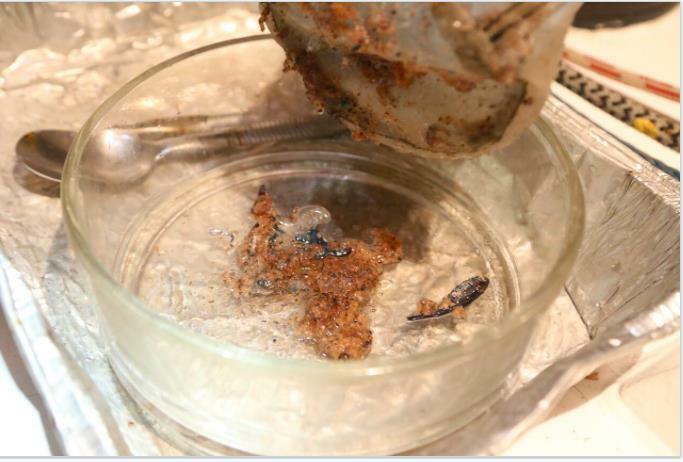 The trawl samples today were another reminder of the extent of this issue; the state of the samples were some of the worst we have seen on this voyage. The plastic to plankton ratio is going to be a sickening result when analyzed, we can tell just from looking at it. We are in a part of the world that fosters one of the “most productive marine ecosystems worldwide” and yet we are finding such high ratios of plastic to plankton. Today we are working with well educated, kind, caring and passionate people and yet they were unaware of the issue of plastic pollution, one right on their backdoor step. The importance of sharing our knowledge is now more evident than ever. Luckily as I write this I am waiting for the Captain to return to pick me up before we head off to the Universidad de Tarapaca where he will be giving a talk about plastic pollution. March 1. 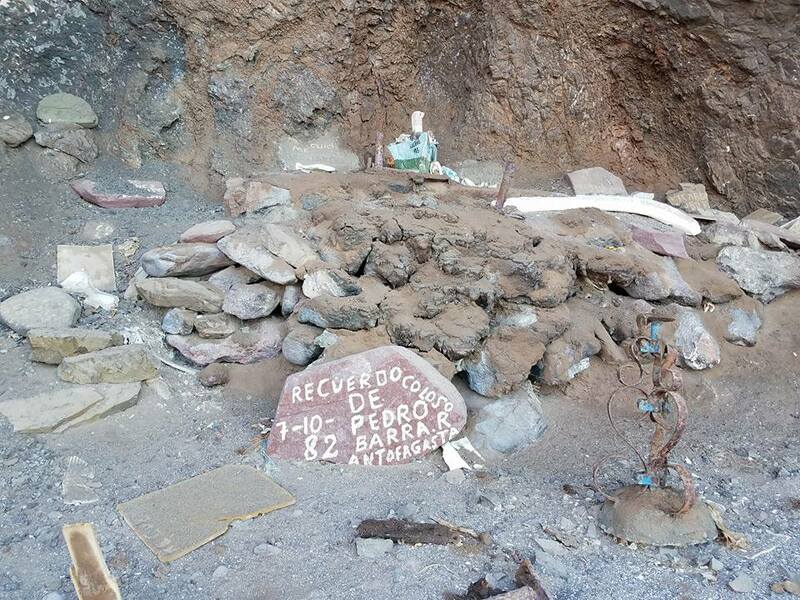 Headed North – Antofagasta to Arica S 18 28.180 W 70 19.208 - – Raquelle deVine. It’s been a whirlwind of a week and we’ve had a great trip up the coastline from Antofagasta to Arica! Exploring small coves, diving, kitesurfing, trash collecting, swimming, trawling and exploring old abandoned Nitrate mining towns. The days and nights were full of interesting and thought provoking conversations with our new crew that are accompanying us this leg, a real mixed bag of characters from very different backgrounds including a dentist, a marine ecologist and an anthropologist. Check out the Team page to learn more about their stories. We arrived in Arica on March 1st, in a bay abundant with bird-life. We had been cruising through a thick plankton bloom for the last few days, which is typical with the heat at this time of year. It filled our trawls, clogged our water pump but was the source of the most beautiful bioluminescence at night! We are now anchored and sad that our new crew will depart so soon. We’ve been anticipating our arrival in Arica and the warmth that comes with traveling towards the equator. Algalita has many great connections with groups here in Arica, including the American Corner of Chile, U.S. Embassy and the University de Tarapacá. Over the coming week we will be bringing youth onto the Alguita for a day of research, sampling and education, through our Ship to Shore Program, and work with the local turtle conservation group. We will be sure to keep you posted, but for now meet our crew…The Antofagasta to Arica crew all sporting hard hats collected as debris from one of the trash collecting missions. During the month of February, the ORV Alguita made port in Valparaiso, Coquimbo, Antofogasta and Arica, bringing students on board to join the crew in near coast research exercises. These short trips helped to expound on "The Plastic Pollution Conversation" Captain Moore initiated in 2012 with his Pacific Rim Tour. It’s been over three months since Captain Moore and the crew of the Alguita set sail for the South Pacific. In that time they’ve crossed the Equator, visited the Galapagos, Easter Island, and have sampled the South Pacific Gyre. The crew has been hard at work collecting 89 samples so far, pulling in Lantern Fish, patching equipment, surviving storms, collaborating with Universities and NGOs, and writing blog posts. 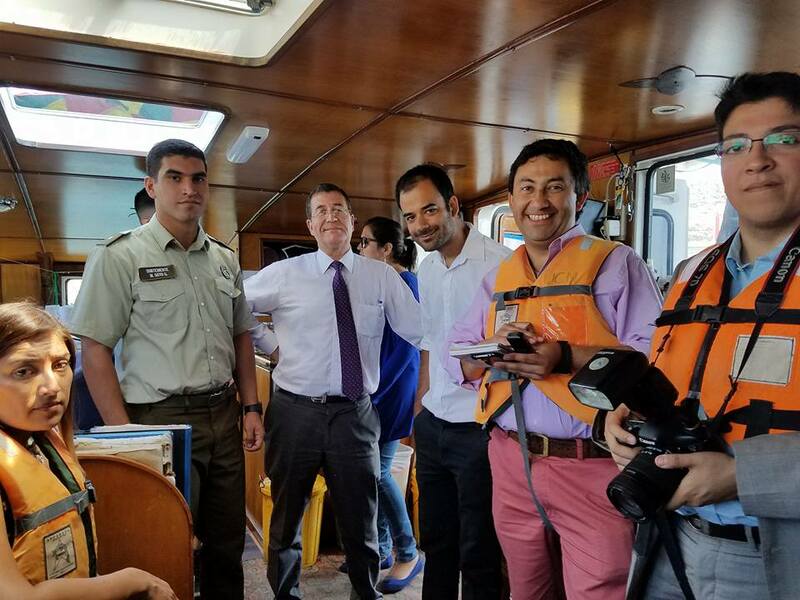 Arriving in the Galapagos in late November, Captain Moore developed a strong relationship with researchers at the Universidad de San Francisco de Quito. Because of the connections made during this expedition, the University’s Marine Science Director, Juan Pablo Muñoz, and his students are scheduled to study plastic pollution in the Galapagos archipelago aboard ORV Alguita once it returns to the area in late April 2017. After departing the Galapagos, our crew successfully made their way to Easter Island where they worked with locals to collect water samples. Leaving the island on January 4, they began their journey through the heart of the South Pacific Gyre toward Valparaiso, Chile. Captain Moore was surprised to see that plastic pollution in the South Pacific was visibly different than debris in the North Pacific. Instead of consumer goods like bottles, toothbrushes, and packaging, our crew came across an immense amount of commercial items like fishing debris, buoys, and bulk containers. 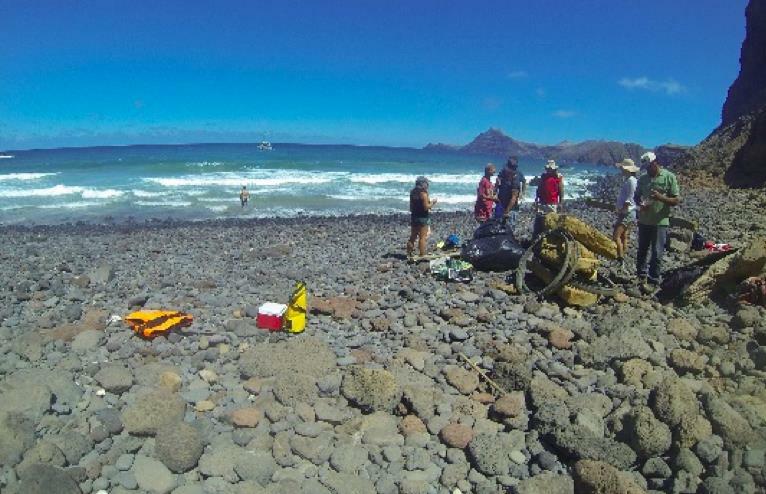 On January 24th the crew landed on Robinson Crusoe Island and jumped right into a beach cleanup with the locals. The beach debris was transported to the dock and forklifted over to the Fisherman’s Locker, where Captain Moore presented to community members of all ages. A few days later the crew departed for the mainland, arriving in Valparaiso,Chile on February 1. 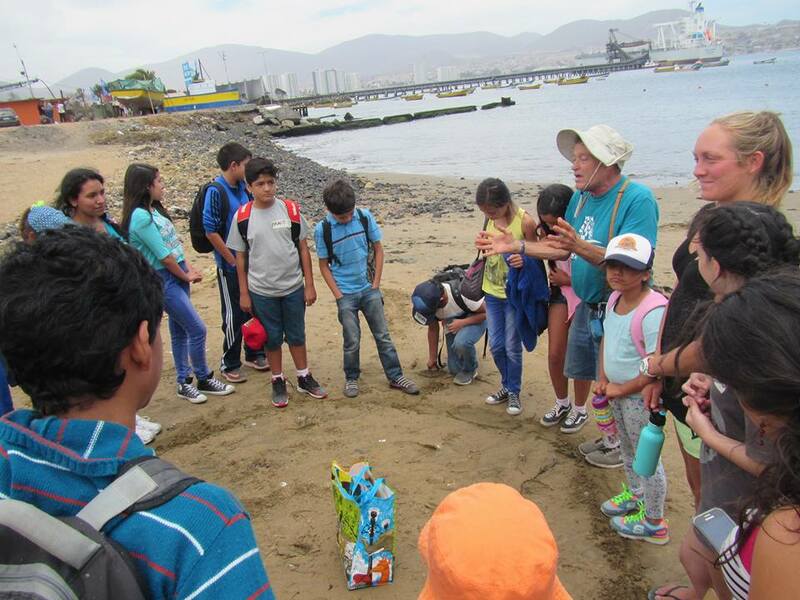 Over the past week, our crew has been working with the Cientificos de la Basura Program, organized by Professor Martin Thiel of the Universidad del Norte in Coquimbo. This group produced the first nationwide study of plastic pollution along the coast of Chile and we’re honored to be able to share our work with them. Partnering with various Chilean Universities, our crew will travel over 1,200 miles north along remote Chilean coastline collecting water and sediment samples. The vessel will make stops to work with local scientists in Coquimbo, Antofagasta, and Arica before returning to Easter Island in early March 2017. As Captain Moore travels from port to port, he is weaving together a network of scientists and change-makers that will continue to work on the issue well into 2017 and beyond. February 6. 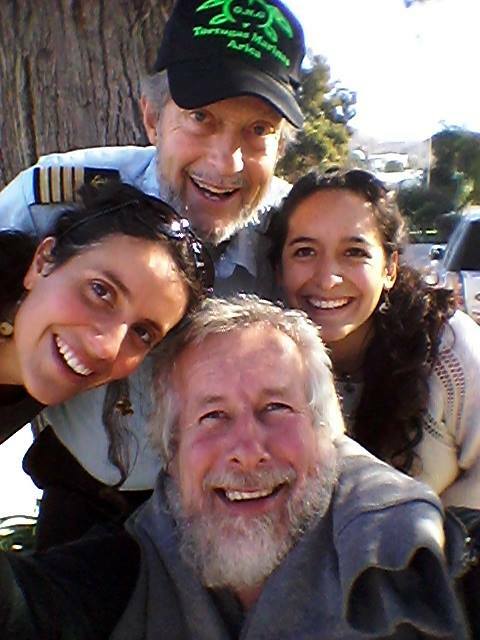 Captain Charles Moore and his crew are now in Coquimbo with Professor Martin Thiel. 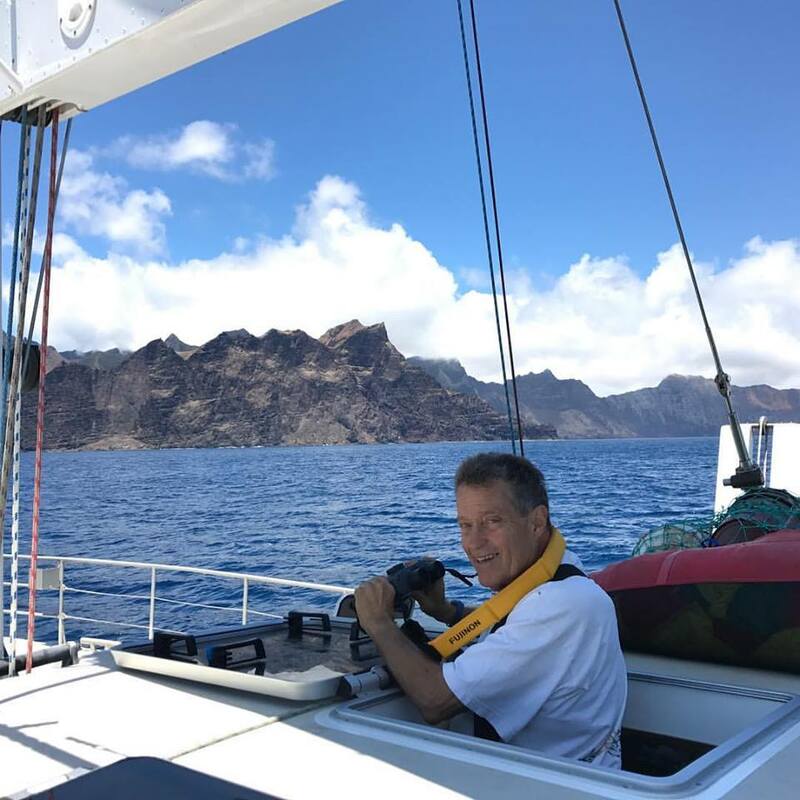 This is the second of several opportunities he is making available in the Chilean ports listed below as part of Algalita's 2016-17 South Pacific Gyre Expedition. His research vessel, The ORV Alguita, is joining with various Chilean Universities and concerned groups to accomplish near shore studies and compare them to data previously gathered in places like California..
"Great crowd at my presentation on our findings during the first extended sampling for plastics in the immense South Pacific Gyre. 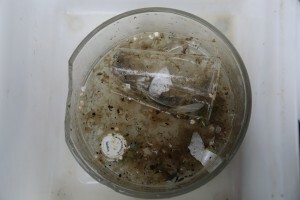 The samples looked like our 2007 North Pacific Gyre voyage with less consumer goods and more fishing related plastics. The Event was hosted by Higuerillas (Castor Beans) Yacht Club." Read the Spanish version of my interview appearing in El Mercurio de Valparaiso Manana. January 27. Leg 5 Complete.– – Raquelle de Vine. We made it!! Concon, Chile. The South American continentis beneath our feet! We arrived on Thursday morning through a thick fog caused by large forest fires that are currently wreaking havoc throughout the lowlands and valleys of Chile. This explains why our trawl the evening before was full of ash and terrestrial bugs and debris, even a ladybug! As we docked at the Yacht Club at Higuerillas, Concón, a sense of satisfaction surged through us all as we acknowledged the safe and successful completion of the 5th leg of our expedition! The reality of being back in civilization hit hard when we glanced over the side of the boat and saw a mess of plastic bags, bottles, wrappers, line, and other single-use plastics.Here in this town, plastic is everywhere. It is in the gutters, in the bushes, along the streets, in the water, down the cliffs and of course along the beaches…but this is no different to anywhere else in the world. It is a constant reminder to us of the importance of addressing the reduction and management of the use of this invasive material. For the next few months the tune of the voyage will change as we sail down the coast of Chile. It will be nice to enjoy the delights of land while we work to connect with local communities to raise awareness of this issue. Here in Concón, Captain Moore has a talk arranged at the yacht club for Saturday evening. On Sunday, we’re hosting a community cleanup at Roca Oceànica, a beautiful nature reserve that has become more of a trash bin over the years. Although plastic pollution is an obvious problem here, we’ve met many change-makers doing amazing things in the community. Yesterday we checked out the Punto Limpio, which are the recycling stations found all around Chile. They are comprehensive, fun and simple! January 24. Isla Robinson Crusoe. Raquelle de Vine. Well my friends it was a whirlwind of a few days but great days! We were treated to a welcoming BBQ at Germàn and Gloria’s with the other sailors at anchor, three awesome French people two of them left France last year to sail around the world, the other a younger Frenchman who is hitch hiking around the world. They arrived to Robinson Crusoe from Valparaiso a few days before us after having rounded Cape Horn a month or so earlier. A Chilean guy also joined us, who has been working for various different organization’s in marine conservation efforts on the Island for the last 8 years, his latest role is as the director of the Chilean division of National Geographic Pristine Seas program! A few other locals joined throughout the night too. So awesome all the amazing people we get to meet along the way, inspiring, interesting, motivated, passionate and all with the same goal in mind; Protecting the seas for the future generations. The evening stretched into the early hours of the morning with good food, good conversation and the musical talent of the group being shared, with jams on an accordion, guitar, harmonica and tambourine! Sunday, (we arrived on Friday) was our beach cleaning day! Woohoo, just after 0900 we had 19 people load up onto the Alguita, with another boat load of people in front and we headed North and West around the Island to the port by the airport where they all off loaded and hiked over the hill to Playa Arenal. We, aboard the Alguita carried on around the point and anchored in the Bay. Then the fun began! We had a rocky beach full of plastic trash, a shore break, and a long steep staircase being the only land access .. and in need of a way to get the trash back to the main town. With no roads we were left with the Alguita being our only mode of transport. But we were equipped, with a sit on top kayak, our small dinghy, a surfboard and 6 swimmers with fins! Upon arrival in the bay the beach combers had already gathered a pile we could see from the boat! So as soon as we got to shore we were shuttling the trash out, this entailed loading the kayak up, securing it then controlling it out through the breakers and then swimming it to the dinghy where it was then transported to the boat! Four hours of constant trash transportation we were all done. The amazing volunteers had combed the beach and coves North and South thoroughly, filling 3 large construction grade Super Sacks!!! With everything from a hair comb to barrels, and meso to macro debris! However mostly all fishing and commercial debris, continuing the theme we are seeing throughout the Gyre. A beautiful spot, filled with playful sea lions an endemic species, that are super inquisitive as well as an abundance of bird life, Albatross and endemic and native petrels. The vista around was beautiful and it was a spot definitely worth taking a moment to enjoy especially in one of the most biodiverse rich places on Earth, even more than the Galapagos I am told. We were treated to a delicious fresh lobster pasta for dinner and cruised our way back to Bahia Cumberland before sunset. The fun didn’t finish there though, as we still faced the task of getting the trash from the Alguita ashore. So the following day it was shuttled little by little in our small inflatable to Germàn’s boat that could then take it to the dock, where it was packed into the Super Sacks… phew. All of this was just in time to then be forklifted to the Fisherman’s lockers for Captain Moore’s presentation. 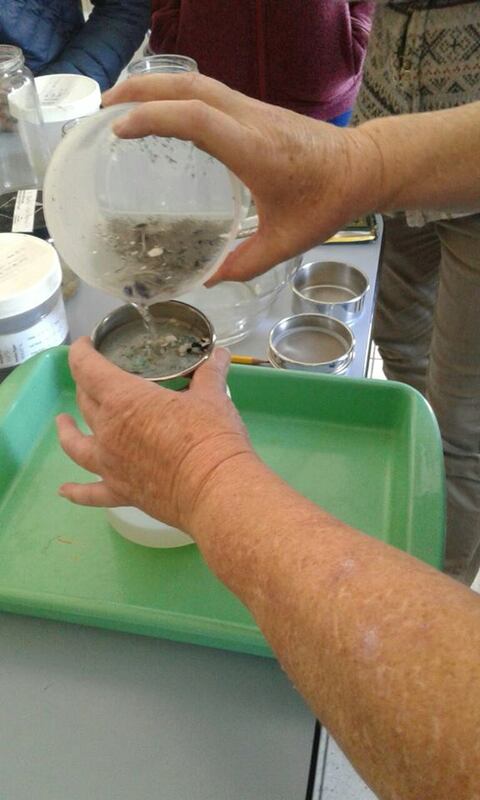 Had another fantastic turn out of interested and concerned community members of all ages, they were amazed to see the gyre samples with the quantity of micro plastics, and concerned about the origin of the plastic. Charlie discussed the voyage, what we are looking at and trying to achieve, the research and how it is conducted, as well as the issues that plastic pollution poses to all, options of reuse in particular for some of the items that we collected, and possible solutions. Considering it was a lot of fishermen debris it was really positive having a representation of fishermen at the talk and in particular them being the most vocal and involved when it came to asking questions. The Island has received acknowledgement from the Marine Stewardship Council for their sustainable fishery practices, they have a large Marine Protected Area established and a forward thinking community avidly involved in protecting their marine environment. There is no doubt in my mind that the information Captain Moore shared with this community will be acted on and put to good use! We are currently underway to our end destination for Leg 5 of the voyage, Valparaiso. We set sail last night after the presentation. So far we have had great Southerly winds and are looking to arrive early! All is well on board! Stay positive, like the community of Robinson Crusoe and remember that solutions are possible. These small remote island communities are the proof of that! January 23.. A stop at Robinson Crusoe Island (Mas a Tierra), 400 miles west of Chile. A fascinating island with about 1,000 inhabitants and a popular tourist spot for diving and hiking. The Cave of Patriots on the northern side of the island once housed Chilean government officials, exiled there after the Spanish counter revolution. It's gratifying to know these folks are environmentally active with the Mantra Reduce, Reuse and Recycle in prominence in store windows. We were pleased to have taken part in one of their beach cleanups. January 20. LAND HO!. S 33° 33.607’ W 79° 14.231’ –– Raquelle de Vine. Today we finally made it to Robinson Crusoe Island, entity of Chile but a world in itself! Beautiful, the landscape looks and feels like it’s from deep within land with high peaks and conifer forests. As though it has just been picked up and plopped down out in the ocean! Soon after arriving, Germàn and Gloria from the local NGO Juan Fernandez y Desventurada came out to the boat to meet us. Fantastic! We now have a talk with the local community arranged on Monday for Captain Moore to present the issue to the locals here AND a beach clean up on Sunday at one of the Westerly facing bays that typically collects a lot of trash. The island’s fishing practices and implementation of marine conservation are at the forefront of sustainable practices. With their popular Lobster fishery having strict restrictions in place since the 30s, the community uses only wood and metals for their traps. However, rope and line are still used A LOT…so we’ve decided to focus on raising awareness of the accumulation of this type of debris in our ocean. January 16. FINDING IDENTICAL ITEMS DAYS APART. – S 33° 08.367’ W 87° 57.724’- . Raquelle de Vine. We’ve been seeing less plastic in our trawls since we left the accumulation zone of the South Pacific Subtropical gyre. Over the next few days we’ll anticipate seeing less and less as we continue East towards land. After a busy morning of trawling we stopped for a nice long swim and some watermelon. Almost immediately after getting underway Doshi, who was on watch with Charlie shouted, “DEBRIS! Off the port side!” and all of a sudden we were pulling macro debris from the ocean around us. We recorded the coordinates, weighed, photographed, and tagged each piece. Any interesting specimens we found were collected and preserved, just like our trawl samples in 5% Formalin. In order to save special items for chemical analysis, such as the polystyrene plastic on the foot of a Gooseneck Barnacle or the tissues of a fish that has ingested plastic, then we freeze the samples as they are. One of the highlights of this trip is when an interesting species come in with a trawl or piece of debris, like this Glaucus atlanticus, a nudibranch – one is the biggest one I’ve seen so far. The plastic itself is quite interesting too. Each piece degrades differently and it’s always a challenge figuring out what it used to be or where it may have come from. Almost every object has bite marks and we’ve even found some matching items like these jugs! A fantastic place with wonderful people and a rich Maritime history of early Chinese merchants, Pirates and Spanish colonization. Recently wiped out by a Tsunami in 2010, the community is rebuilding with amazing strength and ingenuity! Enjoy the weekend and we will be sure to share how the rest of our time here goes. January 18. SPRINKLES IN THE SEA. 2.75535 -92.464383 –- Raquelle de Vine. Remember eating sprinkles on cupcakes as a kid? The tiny little colorful sugary beads… So colorful and delicious and always associated with good times…! But, if you spilled them, man oh man, what a task it was to clean up all those hundreds of colorful tiny sprinkles. This thought has been running through my head over the last few days as we’ve been inspecting more and more trawls heavily laden with plastic…We began our one-hour trawl samples a few days ago as we crept closer and closer into an accumulation zone of the South Pacific Sub Tropical Gyre. I say ‘an’ rather than ‘the’ because we have had several High Pressure systems showing up within the sample area and we know that these high pressure systems create the winds that circulate the surface currents into sub gyres / accumulation zones. Generally, in each of the oceans gyres there is a permanent pressure system that creates an accumulation zone, which is what we have been hoping to track and sample. However, it is always changing in size and shape because of the constantly changing oceanic conditions. This means that despite there being a general location where you can expect an accumulation area, you can’t just pin the spot on a map and arrive at the central accumulation zone at any time of the year. Also, factor in the fact that 81% of the Earth’s surface south of the equator is sea water. It’s like we’re storm chasers, except we are looking for the stellar calms, tracking the weather on our computer navigation system (remember Buck talking about TimeZero on Leg One?). We compare our coordinates to Maximenko’s model of marine debris accumulation determined by the trajectories of Lagrangian drifters and the map of highest plastic concentrations produced by 5 Gyres during their March-April 2011 voyage. From the models, we expected to encounter higher concentrations further west in our journey, however, after several days of steadily increasing quantities of micro debris in our trawls the accumulation zone is apparently currently further East than predicted. Each day I think we have seen the worst of it, but the sprinkles of debris keep filling the petri dishes more and more, increasing the ratio of plastic to plankton, exponentially it seems. Yesterday, one trawl we pulled in was sickening. Take a good look at the picture, the longer you look the more and more you will see, all the tiny fragments start coming into view, the pieces of line and the overall quantity hits you. One hour!!! The microplastic concentration levels seem to be equivalent to what they would find in the North Pacific Gyre. The abundance of macrodebris has been increasing as well. Traveling in a straight line we collected 5 pieces of macro debris in the timeframe of 15-20min. Out here, we estimate concentrations of macrodebris by counting the number of visible pieces we see in a certain period of time. In the North Pacific Captain Moore describes finding more often consumer goods like bottles, toothbrushes, and packaging but here in the South Pacific, we have been finding mostly commercial items such as fishing debris, buoys, rope, fish bins, lines and bulk containers. In the trawls, there has been an excess of line and filaments from rope and fishing nets, in addition to the unidentifiable microplastic fragments. Today, our trawls seem to be less full of plastics. Together with increased winds and swell conditions, this is a clue that we are moving away from the high pressure cell and the accumulation zone again. Our next stop is Robinson Crusoe Island where Captain Moore will deliver a talk to the local people, in particular the fishermen, about the extent of the issue. We are grateful for fair winds at the moment and by the looks of things as we should have them for the next couple of days. All crew are well despite a few life changing moments in the past few days and we are fully charged for continuing our task at hand. I encourage you to share this information around, share the pictures and the stories! Our oceans are brimming with this plastic pollution but we cannot drain a bath tub when the tap is still on! Stay interested and hungry for change; you are the solution! After a busy morning of trawling we stopped for a nice long swim and some watermelon. Almost immediately after getting underway Doshi, who was on watch with Charlie shouted, “DEBRIS! Off the port side!” and all of a sudden we were pulling macro debris from the ocean around us. We recorded the coordinates, weighed, photographed, and tagged each piece. Any interesting specimens we found were collected and preserved, just like our trawl samples in 5% Formalin. In order to save special items for chemical analysis, such as the polystyrene plastic on the foot of a Gooseneck Barnacle or the tissues of a fish that has ingested plastic, then we freeze the samples as they are. One of the highlights of this trip is when an interesting species come in with a trawl or piece of debris, like this Glaucus atlanticus, a nudibranch – one is the biggest one I’ve seen so far. The plastic itself is quite interesting too. Each piece degrades differently and it’s always a challenge figuring out what it used to be or where it may have come from. Almost every object has bite marks and we’ve even found some matching items like these jugs! January 13. TRACKING BUOYS. -31.426833 -98.119333 – – Buck Osequeda. We find a lot of abandoned buoys in the South Pacific, in fact we’ve found four so far. They can come loose from fishing nets, off the sides of boats, or just be abandoned. But, the latest buoy we found is very unique. It’s a unique buoy because at one point it recorded and transmitted oceanographic data as opposed to the rest of the buoys that are used as aids in fishing. I say that the buoy did transmit, because we disassembled the whole buoy, tested the batteries (which are dead) and tried to figure out how it functioned. I felt like a kid disassembling my VCR. Unfortunately, none of our computers on board have a SATA input so we couldn’t connect to the buoy and therefore don’t know exactly what it recorded. 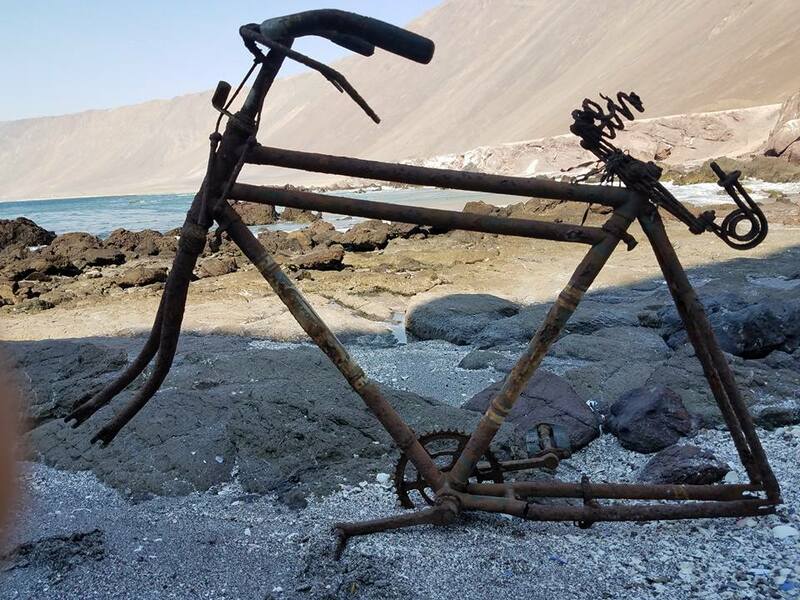 We also don’t know who put it in the ocean, but it is probably from an organization like the National Oceanographic and Atmospheric Association (NOAA) in America or the National Institute of Water and Air (NIWA) in New Zealand. Of particular interest to us aboard the Alguita is the Global Drifter Program through NOAA. Buoys, much like the one we found, were tracked via satellite to help determine sea surface currents. Data gathered by these tracked buoys were then used in a model to help determine zones where debris may accumulate. We, as debris scientists, then plan our route using those models and validate statistical models with field work. You can picture these accumulation zones as large vortexes that swing trash around their outer edges and slowly funnel detritus into their centers, like some sort of trash-filled black hole. The buoy is also unique because it is the first piece of trash that has a date on it, January 2007. This means the buoy could have been floating for up to 10 years! This is an important piece of information because we know it has had time to travel sea surface currents and should theoretically be deep in the gyre. The buoy’s age, the amount of plastic debris we’ve been finding in manta trawls, and the high pressure zone around us leads us to believe that we are currently deep within the South Pacific Gyre. It takes culminating factors such as these to determine if we’re in the gyre because natural phenomenon occur differently in the ocean than they do on land. You can’t just go back to the same coordinates and expect to find similar conditions as a previous study. You have to look at conditions such as air pressure, sea surface temperature, depth, and sometimes even the age of buoys. The gyre is constantly moving and I’m stoked to realize that we’re right in the middle of it! …but then my heart sinks when we pull up the trawl and it’s full of plastic. January 10. GHOST NET. - 29.0625, -102.15415 – – Raquelle de Vine. By 1700 yesterday evening our Manta Trawl samples were diminishing in micro-plastic quantities and our macro debris collection was nil. A positive sign? Yes, in some ways. It’s telling us we were moving along the edge of the accumulation zone, rather than into it. We dropped our sails and altered our course to begin to head southeast where we could observe a larger high pressure system on our radar, signs of a calm region where plastic may be accumulating. .Within half an hour of changing our course we spotted our first item of macro debris, a 30cm long white HDPE (High Density Polyethylene) plastic casing, with bite marks in it! We are on the right track. Looking at the bite marks, some big teeth have chomped into this one! The next half hour bought along a ghost net, quite a hefty bundle of loose net floating aimlessly through the ocean, collecting whatever unsuspecting thing or creature gets in its way. Due to this one’s minimal organic fouling and collection Captain Moore predicts it can’t have been adrift for longer than 3 months. There were several juvenile and small fish species that were hanging around it, some of which are common coastal species to the region. It’s a sign that the net came from a far off coast, even though we found it over 300 nautical miles from land and in waters over 2 miles deep. This kind of debris not only destructively captures and kills marine life, but also alters the ecosystem by providing an artificial habitat. We hauled the net aboard and tried to free as many of the small crabs as possible. We will take it with us to Chile where we hope to deliver it to one of the fishing net re-purposing initiatives they have there, such as Bureo Sunglasses and Skateboards. In the meantime, it is sitting up on the top deck along with the rest of our debris that we collect. As you can see in the picture, we’ve collected a lot of macrodebris, but it’s not as easy as it sounds! The person who spots the item calls out, and keeps their eye on the piece as it’s easy to lose track. The crew member navigating slows the boat down (by hauling in a sail, turning into the wind or slowing the motors) and we take a detour to retrieve it. If it is a large piece, we’ll jump in and dive around it to film it and see what we can get for dinner, before hauling it aboard. I am often grateful for the electronic winch and large gantry arm off our stern when it comes to hauling these objects out. We’ll be sure to keep you updated as we head further into the Gyre! January 9. WHAT IS A GYRE?S 27.36025, W 103.199333 – – Raquelle de Vine. We are back at sea and making our way to the convergence zone of the South Pacific Gyre. Our first couple of days have been focused on getting underway. With good winds we’ve been making good headway. Yesterday the winds died allowing us to begin trawling again, right in time as we just entered the region where we planned to begin sampling. The trawls contained similar quantities of micro-plastics to what we were finding last week. It pains me that it no longer comes as a surprise to consistently see this quantity of micro-plastics. 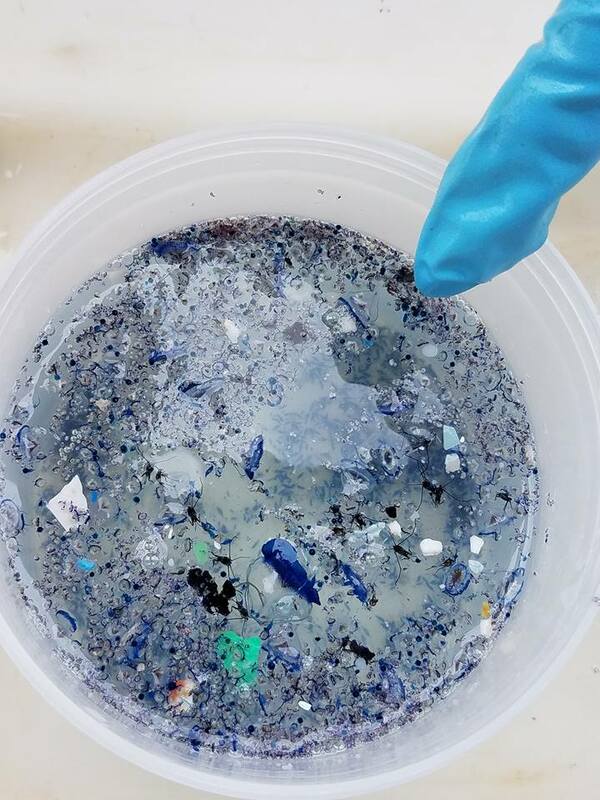 During our sampling last week we had very high concentrations of microplastics, being right in a calm patch of an accumulation area, a sub gyre of the South Pacific Gyre. Do you know what a gyre is? Our expedition is focused around sampling the South Pacific Gyre. In short, gyres are the great circulation systems of the oceans. Remember the blog on trade winds? If not read blog from the 12.11.16 “Fair Winds, I’d say so”! Consistently blowing winds drag the surface waters with them, through the force of friction. This forms a massive, but slow, flow of water within each of the oceans mainly in the direction of the trade winds flow. This turns into a circular pattern as influenced by the locations of continents and the ocean basin topography (depth of the sea floor). The 5 major gyres of the ocean are therefore known as geostrophic gyres. Geostrophic means: relating to a current that is formed from a balance between pressure gradients and coriolis forces. You can see in the image how Australia and South America border the South Pacific Gyre to the West and the East. But what is bounding the gyre to the north and south? The Equator borders it to the North and the Southern waters border it in the South. To understand these invisible boundaries, remember that the winds that create the flow are the trade winds which are determined by the circulation of the Hadley Cells. The Hadley Cells of the Northern and Southern Hemispheres meet at the equator with the low pressure belt of the Equator separating them and deflecting their air circulation in opposite directions. This creates the northern boundary. In the South, the air circulation of the Polar Cell forms a Southern Boundary with the different surface current’s the winds create there. The gyres are typically divided by boundary currents. These are currents that flow north-south usually along the coasts of the continents. The movement of cold water equatorward occurs on the eastern side of the ocean so they are called Eastern Boundary Currents. The movement of warm water poleward happens along the west side of the oceans so they are called Western Boundary Currents. Transverse Currents link the eastern and western boundary currents. These are the major currents of the oceans. Perhaps you’ve heard of some: the California Current and the Humbolt/Peru Current are the Eastern Boundary currents of the North and South Pacific! Looking specifically at the South Pacific Gyre, which flows anti-clockwise, its northern transverse current is the South Equatorial Current, the Western boundary current is the East Australian Current, the Eastern boundary current is the Humboldt/Peru and the southern transverse current is the Antarctic Circumpolar Current. Each of these currents flow continuously on their paths, past land masses and across the ocean in their inclined direction. The ocean water flows are directed by the spinning of the earth, gravity and the corriolis force (remember, it’s the one that makes things take a curved path on a spinning surface). The currents transport whatever floats in the surface waters, so as plastic debris is released into the ocean from the coastlines, eventually its gets picked up by one of the many currents flowing around the perimeter of the ocean. Once in circulation, they will either make their way into the central accumulation zone of these Gyres, or be deposited somewhere on a coastline. Some plastics may also sink to the seafloor under certain conditions, or be eaten by an organism. To better visualize what is happening, think about what happens when you stir a hot drink, like hot cocoa, round and round. All the froth ends up in the middle. This is essentially what is happening with all the marine debris in the Gyres, the currents circulate it around and around, but eventually it will get concentrated into central areas, literally just like a plastic soup. The accumulation zones where we find the large quantities of debris. On our trip through the gyre we will try to better understand this accumulation of plastic debris in the South Pacific Gyre. So off we sail to the accumulation zone, using the winds to take us there, just like the plastic debris. Hello, my name is Constranza (Conni) Hernandez Urbano. I come from Valparaiso, Chile and I am a Licensed Oceanographer, from the Universidad Catolica de Valparaiso. I have been working in the laboratory, studying the effect of greenhouse gases specifically on the local fish called Seriola Lalandi. 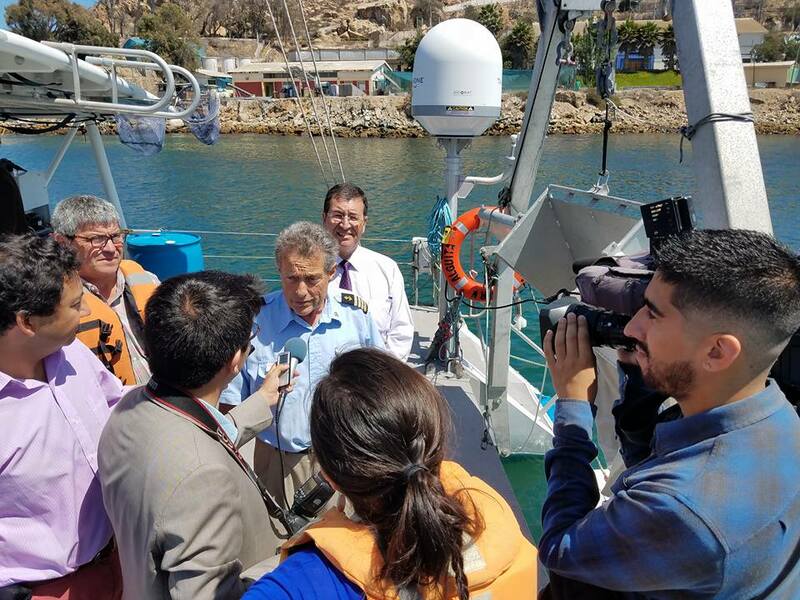 My work aboard the ORV Alguita will be as the Official Observer for SHOA (Servico Hidrografico Y Oceanografico del Armada de Chile) controlling the methods and extraction of samples within Chilean waters. I will be aboard for the voyage to Valparaiso and north up until Arica. This is a fantastic opportunity to gain experience working in an international environment learning about different facets of science related to marine pollution and creating contacts. Also this is a great personal challenge to cross the ocean in a sailboat, this being my first time ever sailing. My name is Michael Doshi, in the plastic pollution world I am known as the Gnarly Beach Cleaner (GBC). Along with my GBC crew, I spread awareness of plastic pollution through pure fun and positivity. On social media I create funny photos and videos to tell people the bad news about single-use consumer goods and plastic pollution, but in a good way! These photos and videos can be found on my Instagram account @gnarlybeachcleaner. Even though plastic pollution is a major global problem, my crew and I believe we can still have fun while helping to solve the issues, thus sparking the #makeitfunmovement. In addition to GBC work, I volunteer with Surfrider Foundation’s West LA/Malibu Chapter. Most recently during the November elections I helped with their CA single-use plastic bag ban campaign, which we won! I enjoy bringing the fun to their local beach cleans and I also help with their Ocean Friendly Restaurants program in Los Angeles. I am a volunteer member of Heal the Bay’s Speakers Bureau, which allows me to engage a wide array of local Los Angeles County residents to educate them about plastic pollution and LA watershed issues. I speak with the majority of the people during large beach cleans, which gives them the opportunity to view the plastic pollution on the beach first hand. I enjoy this type of hands on education! Ever since I read Plastic Ocean by Captain Charles Moore a few years back, I told myself “one day I’m going to go on a Gyre expedition to help with plastic pollution research”, and here I am, currently on an expedition through the South Pacific Gyre with the legend himself, Captain Moore! I’m so stoked! The opportunity came to fruition through a good friend of mind on the international plastic pollution team, Tim Silverwood, CEO of Take 3 in Australia. Tim visited LA recently and brought the expedition to my attention, took me to the Algalita office to meet Captain Moore and Executive Director Katie Allen, and pushed me to take the leap to join the expedition. I’m very thankful to have Tim as a mentor and grateful he encouraged me to join the expedition. I’m on the expedition from Rapa Nui to Valparaiso and then joining the crew for the first leg up the Chilean coast to Coquimbo. During the expedition I’m hoping to further my knowledge on plastic pollution as to help the global plastic pollution team on a larger scale. My goal is to earn a career at a non-profit, so I can dedicate my full time to helping spread awareness of plastic pollution issues to the public. On the expedition, I plan to generate a lot of fun social media content to keep the stoke alive. I want to teach people to live in the present with undertones of longevity, while staying stoked!! Really awesome meeting all these new and wonderful people working towards the changes we want to see in the world!! Arohanui my friends! Easter Island is famous for unsustainable use of limited resources. Perhaps this is why only current residents are building a self-sufficient community called Tiko. January 6. AT ANCHOR - HANGA ROA – – Raquelle de Vine. We’ve been anchored at Rapa Nui since the first day of the new year, re-provisioning and repairing the vessel. The sampling that we did over the last leg, revisiting our 2011 study, was especially interesting for me, as I am from the South Pacific myself. Analyzing the state of plastic pollution in the Neuston layer (the surface waters that we are sampling on this voyage) in this remote part of the world, I am not sure what is more shocking: the trawl samples laden with micro-meso debris, the quantity of macro debris we have been retrieving or the number of plastic fragments found in the stomach of every fish we catch. In addition, the number of fish baskets from New Zealand companies is astonishing--I need to raise their attention to this! What’s the worst of all this? We are sampling mostly within the waters of Rapa Nui, one of the most isolated places in the world. We know the debris we find in these waters mostly does not come from the inhabitants of the island only 166km², but they are located within the convergence zone of the South Pacific Gyre and therefore become a depository to the trash that is circulating the Pacific. So what do the people of Rapa Nui do about it? Many advocates on the island are working towards raising awareness, reducing plastic consumption on the island and implementing initiatives to tackle the issue! Advocate Sebastian Yankovic Pakarati was on board for the most recent leg, and we’ve since joined forces upon returning to the Island to spread the word about our work! 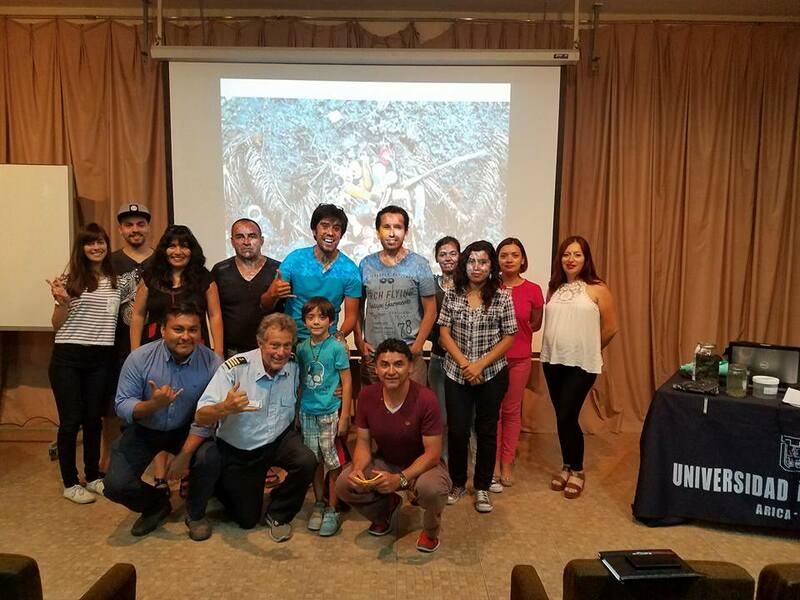 Yesterday evening Sebastian, Juan Pablo from the Galapagos (who was also on board) and Captain Moore delivered a presentation to 60+ attendees on the issue of plastic pollution. They compared the two island communities, Galapagos and Rapa Nui, discussing similarities and differences in how the issue is affecting the communities. The presentation went well with lots of positive response, and it was filmed to be put on the local news. So here’s to spreading the word initiating action plans. It frustrates me, though, that they’re the ones having to dedicate so much time and effort to addressing an issue that they are on the receiving end of. I feel a renewed sense of the importance of this expedition as we set off on Leg 5, which is taking us to the main destination of our Expedition---the South Pacific Gyre accumulation zone. Along the way, we will dive deeper into the science of the issue, gathering more data and evidence on the state of micro plastics in the Gyre. In time, the data we collect will be used to build an international and widespread understanding of what is going on in this part of the world’s oceans. It is so evident being here, in Rapa Nui, that this is not an issue to be dealt with nation-to-nation. The information we are gathering is crucial to support the more international and collaborative conversation efforts, from large continental nations to small island ones! As we pull in our anchor this evening to set off east towards the Gyre, our motivational fires are stoked with the passion of the Rapa Nui people. We are intrigued about what we will find next. Lorana everyone. January 4.. Today Michael Doshi, crew member on the Algalita Expedition, gave a guest lecture to the plastic attending La Playa de Ovahe! He explained to them that if not picked it will eventually break down into micro-plastics that will remain in the ocean and on beaches forever. He will be taking it to @vaimanusurfexperience to see if they want to keep it on display to educate the local surf youth and tourists about plastic pollution on Rapa Nui 🗿!